If you own an in-ground swimming pool in Pittsburgh, chances are you have been mandated to install a pool fence around its perimeter to protect unsuspecting people from inadvertently falling into the water. While you are mandated to install a fence, you do have options regarding its aesthetics and materials. 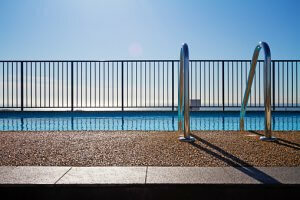 There are currently three popular types of fences used to surround a pool. Either of the three, ornamental aluminum; PVC; or wood, will get the job done and can be completed fashionably. An ornamental aluminum fence is currently the most popular type of pool fence being installed across the country because of its durability and sophisticated appearance. The fence is coated with a dry powder and cured under heat that allows it to form a skin-like texture. The panels are manufactured in six-foot sections and are equipped with a top, and bottom, rail. The pickets are fastened with rivets or screws. Pros: The advantages outweigh the disadvantages. The aluminum fence is very durable, low maintenance, and inconspicuous. An aluminum pool fence in Pittsburgh is a good option since it will not rust. Cons: Unfortunately, if you are seeking privacy with this fence, it will not happen. PVC has become a very common material to use for Pittsburgh pool fencing. There are typically two styles installed. A standard PVC fence that stands 48”-54” tall and is a solid, or spaced, panel. The other is a 6’-7’ solid panel. You will find that many of these fences have lattice, or spindles added on the top for style. Pros: These come out pretty even so you will need to determine what is the most important function of your fence, other than stopping a child from falling in the pool. These fences are great for securing privacy; they require little maintenance; there are several styles, and they can be customized by the manufacturer rather easily. A PVC pool fence in Pittsburgh is a good option due to the fluctuating weather. Cons: On the flip side, the gates will eventually sag; the pickets and rails tend to run large; the white color stands out, and mildew will often form when moist. Wood is the most customizable material to use for a fence. The only limits to the creative design are what you allow them to be. They just speak natural and look very fresh when newly installed. Wood materials used for a fence are relatively inexpensive but they do have a shorter lifespan when not properly maintained. Pros: Grab your saw and design exactly what you want; the expense is less than the aforementioned fence styles; you can color your fence whatever you desire. Cons: You will need to wash and paint this fence every couple of years and wood will eventually weather, causing warping and twisting. Weather will not be kind to your Pittsburgh pool fence. Whatever you choose, just be sure it fits your needs AND your wants. There are many choices, so take your time and beautify your poolscape. Additionally, the materials that you use for your swimming pool fence in Pittsburgh are important to consider given the year-round weather. When you are looking for Pittsburgh Pool Fencing, you can contact professionals like Fence By Maintenance Service to help with your fence installation.